Note: This post is now linked to Seasonal Eats for May 2012 at Delectable Musings. When I was at La Unica looking for the aji amarillo paste for Tacu Tacu, they had chorizo on sale so I bought some links. 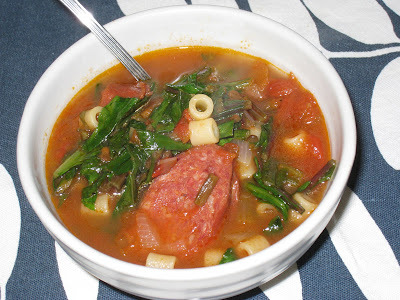 I wasn't sure what I wanted to do with it, but I thought it might make a nice soup with some dandelion greens and ditalini. I was right. This is another one of those soups that you can put together on the fly, with whatever you already have on hand. It would work equally well with fideos or rice, and you could easily use any greens, even frozen spinach if that is all that you have. I used chopped "canned" (mine come in a box) tomatoes, but you could use fresh, or just tomato sauce, or leave them out entirely. The same with the stock. Vegetable stock was what I had, but I could have used chicken stock, or even water. The possibilities are endless. Some people will tell you to cook the pasta and add it separately to the soup as you serve it to prevent it from getting overcooked and soggy. Maybe it's all of that canned crap that I ate as a kid, but I actually don't mind the overcooked pasta (in soups only, mind you). So do what works for you. Add a scant teaspoon of oil to a large heavy pan over medium heat. Add 2 links of sliced chorizo or other sausage and cook until the fat has rendered and the sausage has browned. Drain all but 2 tablespoons of the oil. Add a chopped onion and the chopped stems of the dandelion greens. Cook. stirring frequently, until the onions are translucent, about 5 minutes. Add a 14.5-oz can of tomatoes (whole, diced or chopped), a quart of chicken or vegetable broth (or water), and salt and pepper to taste. Bring to a simmer and let cook for about 10 minutes. Raise the heat and bring to a full boil, then add 1/2 cup of ditalini or other small pasta. Lower the heat to a slow boil/high simmer and cook for another 8 to 10 minutes to cook the pasta. Add the tops of the dandelion greens, cook for another minute or so, then remove from the heat. Adjust seasonings. Dandelions are in season for me and while I was searching for a recipe to use them in, I found yours. I love chorizo and always have chicken broth on hand but I have not had the guts yet to try eating dandelions just yet. This looks like a great way to take that first step! I would love for you to link up this recipe on my Seasonal Eats May roundup <a href="http://delectablemusings.com/2012/05/seasonal-eats-sheet-may-2012.html>found here</a>, which highlights recipes that use seasonal ingredients in great recipes.